The Ghost Rockets documentary is a personal portrait of the members of UFO-Sweden and their ongoing attempts to solve one of Scandinavia's biggest UFO Mysteries. Every year, the organization UFO-Sweden receives numerous reports about inexplicable occurrences - usually dismissed as having to do with the moon, airplanes, satellites or mental instability on the part of the witness. 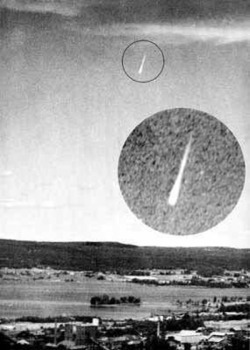 Sometimes, though, they get a report that they are unable to explain, one of them being the story of the ghost rockets of 1946. Under the leadership of journalist Clas Svahn, the organisation starts a costly expedition trying to find the strange craft. It’s thrilling premise notwithstanding, Ghost rockets is not primarily a film about UFOs. It is a film about enthusiasts with a fervent interest, about an organisation struggling with their finances and shrinking membership numbers, about annual meetings over coffee and pastry, about existential issues debated in the summer night and about our need to believe that the world is bigger than we think. Kerstin Übelacker has worked as head of the documentary screening network Doc Lounge with venues across 14 cities in 4 different countries. Kerstin has freelanced as a transmedia producer and has a Masters in Film at Gothenburg University. She is currently working as a producer at Momento Film in Stockholm. Michael Cavanagh has studied film and television at QSFT and RMIT in Australia. Michael and Kerstin have previously completed the documentary The Leftovers (38 min), screened on film festivals and broadcasted on SVT and YLE. As well as making films, Michael works as a colorist, currently at Way Creative in Malmö, Sweden. 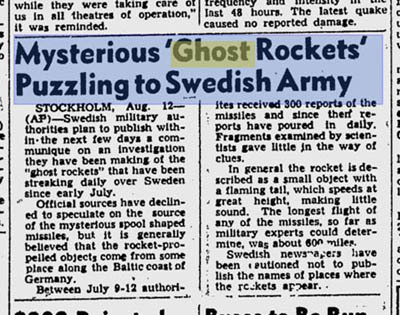 In 1946, Sweden's skies were haunted by the Ghost Rockets, puzzling both the military and the Swedish public alike. Recently the Swedish National Archives released the documents surrounding the investigation and made them available to the public for the first time. As part of the Ghost Rockets project, we have scanned all these documents and built an online investigation platform so that a potentially global UFO research team can access them. With today's technology, UFO enthusiasts from all over the world can help out by searching through these documents and, perhaps, find something inside these Ghost Rocket UFO reports, a clue, a pattern, something that the Swedish military may have missed way back in the 1940s & 50s. A private link of the finished film can be provided ahead of intended release for review purposes upon request. Clas Svahn, head of UFO-Sweden and the main character of the documentary along with the filmmakers Michael Cavanagh and Kerstin Übelacker are available for interviews on all medias, Podcast, Web TV and Press.